A fire has heavily damaged the Tavern in Royal Well. Shortly before noon on Sunday 22nd May a fire appears to have started in the Kitchen which destroyed the roof. 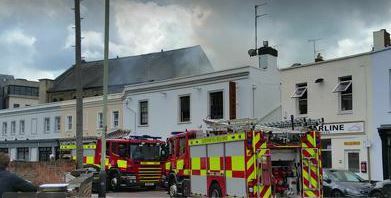 This is the third fire in the Royal Well area in the last few years with one closing the Bayshill and more recently a fire in the Italian Restaurant causing damage to Charlies Chip Shop. Charlies has only reopened in the last few weeks.